It’s been a loooong time since I’ve seen Men in Tights, but apparently I’ve been missing out. Can’t say the dude had all that much competition, but I still would have voted for the cartoon. Nevertheless, we have our winner. Way to help us forget about your performance in Saw, Cary. Always helps to have Dave Chappelle as one of your merry men. Cary Elwes? It could have been worse I guess, it could have been Kevin Costner…yikes. Wha, wha, WHAT??? Cary Elwes?? MEN IN TIGHTS wasn’t even funny. How does he beat Errol Flynn? Further more, how does Errol Flynn only get 10 votes? Jeez! Haha, definitely with you on the strange voting. Men In Tights is hilarious. Hold the phone (Russell? ), that’s the guy from saw? He was brilliant in Men in Tights. I have a lot of admiration for comic performances that make you go wow! I think it’s got to be one of the hardest things to do, especially without an audience. It’s one thing to reel off witty dialogue, but to actually be funny with a straight face, even when you’re not saying anything particularly funny, that’s a talent. Still prefer the fox though. It was like Farthing Wood with bows and arrows, tons of Charisma and oodles of charm. 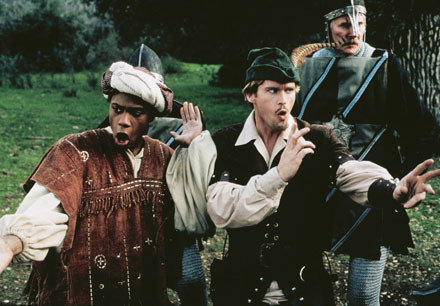 Hey, I loved Robin Hood: Men in Tights. Cary Elwes is hot. He is still hot. Yeah, I watched this thing like gangbusters when I was a kid, but I doubt it holds up. I’m kinda hesitant to watch it again because I’m pretty sure I’ll be disappointed. At least it’s got the nostalgia factor going for it. DOn’t get me wrong, I love Men In Tights and the Sheriff Of Rottingham, but this is definitely some strange voting. I opted for the cartoon or Costner myself, even now I’d consider Crowe, though I haven’t seen Flynn’s. Costner was robbed! But in the shadow of Mel Brooks you can blame him. Haha. Glad you caught on. What’s your new icon btw? I think it’s scaring me. Oh, awesome! I could have sworn it was some mutant gerbil fetus of some sort. Rocketeer is much cooler. Ohh my girlfriend would be pissed if she saw this poll. Flynn is the only Robin Hood according to her. Yeah, strange things are afoot at Cut The Crap.